Panel Discussion on Career Paths in Recording Arts. 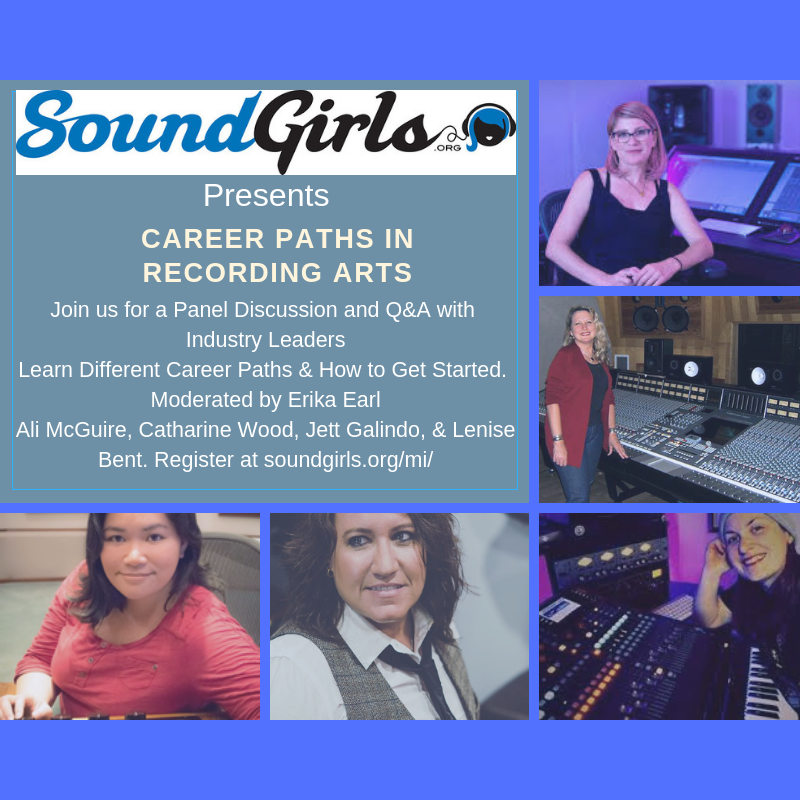 Join us for a panel discussion and Q&A featuring some talented women working and succeeding in the world of recording arts. The evening will end with a casual mentoring and networking session. Moderator: Erika Earl has been working in the professional audio industry for over 15 years. She has worked as the Director of Hardware Engineering at Slate Digital and has held key positions in the audio industry: Chief Tech at The Village Studios, working in live sound, and quality control and repair for leading audio manufacturers including Drawmer, Focusrite, Tube-Tech, and Daking. With engineering credits spanning different genres and legendary artists (Bette Midler, Randy Travis, Nile Rodgers, Roberta Flack, and Gustavo Santaolalla, to name a few), Jett Galindo carries on the legacy left behind by her late mentor, mastering legend Doug Sax (The Mastering Lab). She now works as a mastering engineer alongside Eric Boulanger at The Bakery, located at the Sony Pictures Lot in Culver City, Los Angeles. Catharine Wood is an established Los Angeles-based composer/producer & studio owner. She launched her versatile career engineering on high profile commercials – including the first Apple iPhone spot. As a mix/mastering engineer, she has delivered over 500 (both original & client) commercially released songs airing on many major networks. Catharine is a Grammy®️ Voting Member, P&E Wing Member and holds positions on the LA Recording School’s Professional Advisory Committee and the California Copyright Conference Board of Directors. Her facility, Planetwood Studios, LLC specializes in production & composition services for the Film & TV Industries. Ali McGuire – Recording/Mixing Engineer, Producer, Owner Amaculent Ent. Ali ” A MAC” McGuire is a Los Angeles based Mixing/ Recording Engineer and Music Producer with a background in live sound. Ali moved to LA in March 2017 and has been working with artists and studios around the LA area since. Ali has worked with artists such as Kelly Rowland, Fetty Wap, Post Malone, Kira Kosarin, Skinnyfromthe9, Joji, PNB Rock, Shining Rae, Lizzo, Daxz, Matt Paris, A.M.O., Whitney Peyton, Big Daddy Kane, Schoolly D, Hed PE, The Misfits, etc. As well as record labels, Atlantic, G.O.O.D. Music, HitCo, 88 Rising and more.